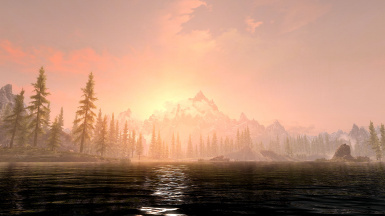 Also a head's up, the sun direction ESPs can be safely flagged as ESL within xedit, it's good for saving an extra load order slot now that they work with enb helper. 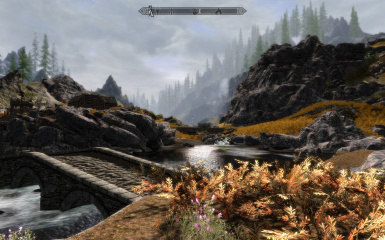 I decided to stop modding. 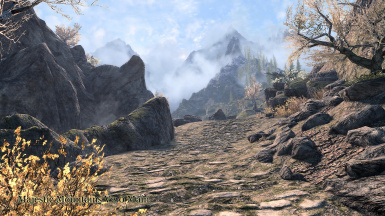 You need to rerun DynDolod if you are using newest version of MM. All plugins (except ESM) were compacted and ESL flagged - new game recommended. I uploaded esp files without esl flag. For everyone who doesn't want to start a new game. 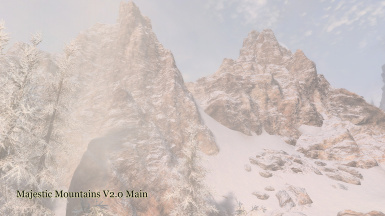 I am also confronted with the problem of purple/radioactive snow on big mountains with MM Main File (currently v2.3). As previously suggested, if I use the old snow (1.84) I have big blocks instead of some mountains and if I use Better Dynamic Snow (BDS) the snow on big mountains is OK but the snow on medium mountains becomes purple/radioactive. Also, I use NMM and it's impossible to move BDS before MM as requested. MM is always on the first rank. Edit1 : Desactivated NAT solves the problem. A suggestion to replace it ? 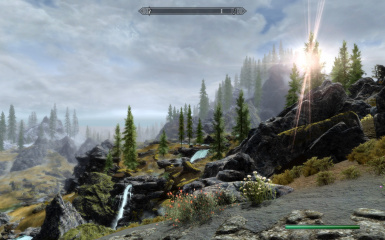 Edit2 : Vivid Weathers Definitive Edition + Enhanced Lighting for ENB (ELE) ?? 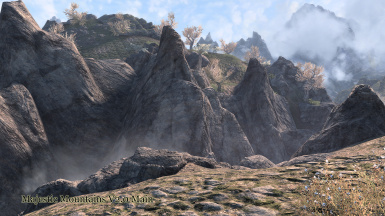 I've compiled the problem of shimmering/gray moutain. Please take a look. Please take a look, even (mostly) vanilla setup suffers from the same problem. Here's what it looks like in fallback mode. So, "BSLightingShaderForceAlphaTest = false" does not completely fix the problem. Your SSEEdit image shows that the correct snow material is applied to the mesh. Something has to interact with the mesh. 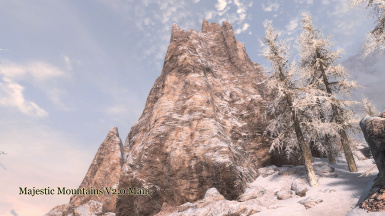 Thanks for the reply, I also have tried without installing SSE Engine Fixes at all but problem still persists (no snow covering mesh). Can anybody else confirm this particular location? 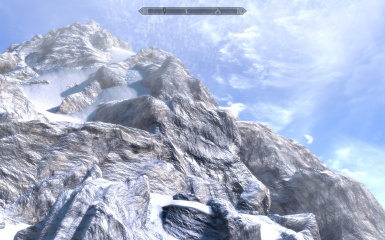 Fallback mode will result in snow covered mountain, looks perfectly fine. If you can't get it working then the fallback mode is made for you. I ran into the same problem. I will try the fallback mode and see if it makes a difference. 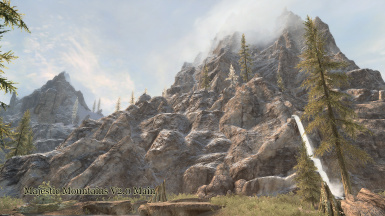 Thats quite annoying because otherwise the new snowmountains look really good. Fallback mode fixed it for me so far. 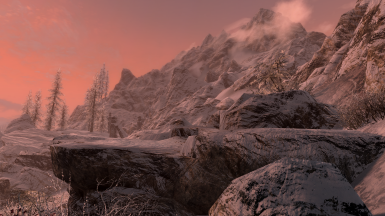 Still trying to figure out what interferes with the new snow shader. Even when MM is loaded last the bug appears. It means ticking the 1.84 option in the majestic mountains installer. 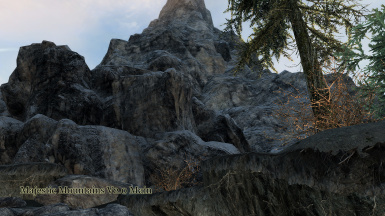 Doing so installs the 1.84 snow meshes instead of the new ones. Some people have problems with the 2.0 meshes. 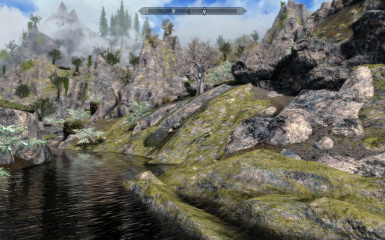 This mod fixed the mesh problems for me: https://www.nexusmods.com/skyrimspecialedition/mods/20102 . It is still up to date and works well. It also fixed the purple tint on the snowrocks01.alt.dds for me. Ofc it only works together with bds. 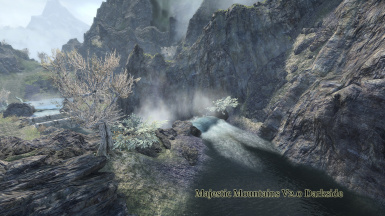 I'm having the same issue with MountainRidge03.nif (same one in the picture). 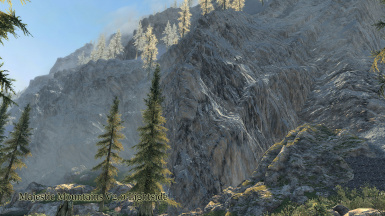 I tried the compatibility patch linked and it actually just straight up nuked the entire portion of the mountain (mountain piece went invisible). 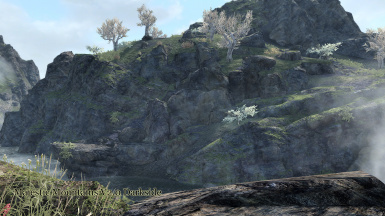 Can we get higher resolution or more detailed rock textures? An updated texture for this would be nice. 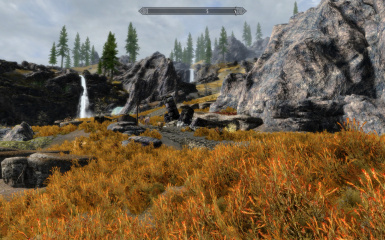 Do you possibly have high enough resolution sources to do a high resolution texture pack? That would be incredible and the ultimate final touch for this mod. You've already done a lot of upgrading in the newest versions. 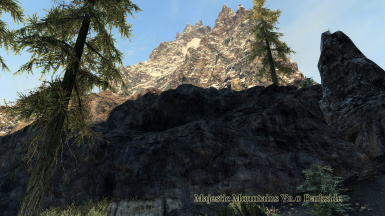 I don't see Majestic Mountain Darkside 1.84 version in the list at bottom. Can you please add it there? I accidentally removed it from Vortex. 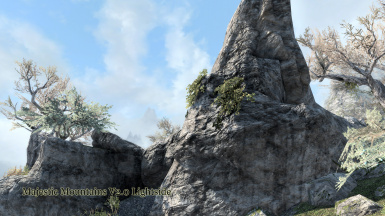 I need to reinstall 1.84 old version to work with Lightside 1.84 and Majestic Mountain Main file 1.84. 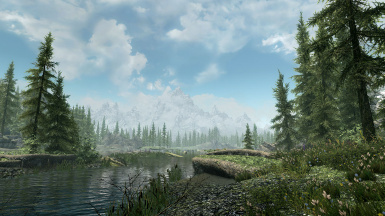 I don't plan to rerun DynDoLOD for 2.3 new version. And I accidently removed it by updating and can't reupload it. Either someone has still this version or I have to rebuild it. I have all 3 of the 1.84 version still on my PC + The Green Waterfall Fixes file. If you need them, let me know. Thank you. You save my day. We need only the Darkside version. I give you uploading permission. Can you drop darkside 1.84 here with manual installation link? 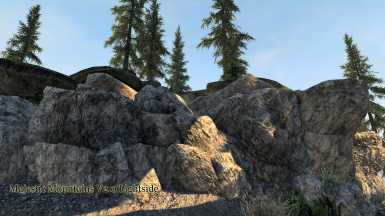 I have Lightside 1.84 and Majestic Mountain main file 1.84 with mod manager download. I don't know if manual installation (darkside 1.84) and mod manager download ( other 2 of 1.84 version ) work fine or not. I will test and hope it works. Of course we need 1.84 darkside and please send it with manual installation link here. Ok, thanks for your permission for the upload. If needed, i can upload the Green Waterfall Fixes too. you mean the option to download it manually ? Yes I mean download manually. I wonder if somehow you can upload darkside 1.84 for Mod Manager download here. If not, it mean someone else who port this MM mod and is able to install 3 of 1.84 for Mod Manager Download. Mnikjom or T4gtr34um3r can do that? I have Green Waterfall Fixes 1.0 version. If member of Nexus might lost or remove accidentally it, permit member to either use mod manager downloand or maual download here. It supports Majestic Mountain. The mod manager download should be set by default. You have to untick this option while uploading. 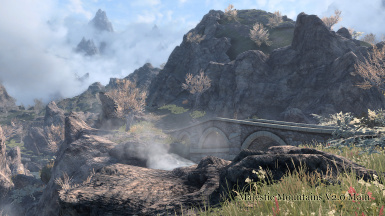 The file was uploaded, you can choose both: Mod Manager Download or Manually Download. Thank you for permitting Penetrator3 to upload Darkside 1.84 here. That's great, thanks for your help to upload Darkslide 1.84 for both Mod Manager downloand and Manual Installation. I reinstalled it to work compatibility with other Lightside 1.84 and Majestic Mountain main file 1.84 without CTD or any issues. 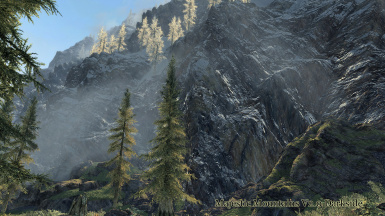 I decided to roll back to 1.84 which is good enough so I am not ready for installing DynDolod for Majestic Mountain 2.3 version. 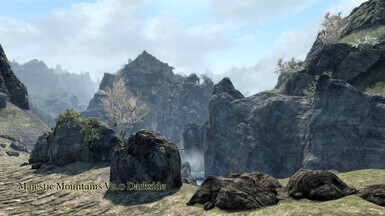 As I looked at the "Non-ESL Plugins" optional download, I wondered why you would be catering to people operating on SSE versions so out of date, when they are either pirates or the Noseless. 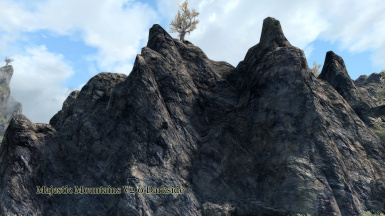 Then when DynDOLOD included your module as a master in the generated files and the ESL flag would have made it an after-loaded master (BIG NONO), I understood why it was a good idea to have those available. Thanks for the foresight. EDIT: Except they aren't. Bug alert! The main reason I provided the esp files is because I was asked for. There are several thousand poeple who are using 1.84. And when they update to 2.x with esl flags and compacted FormIDs there saves are broken. They have to start a new game. And many may not want it. And now I guess that I will keep my postcount on 2222 for a while. Nice work on the update! Could you release a version of the optional ESPs as not flagged with ESL headers, for those who had them already installed on existing saves? I'll add a download in the optional section. Thanks for the prompt upload! And these files Form IDs are not compacted, yes? It is suggested that esp should be updated and the compacted. This is the reason why I kept the original esp files. I couldn't leave with this issues open. 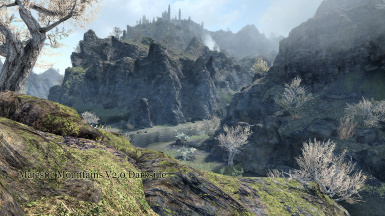 I know I have to re-run DynDoLOD after upgrading from the version 1.84. But is it required to re-run it after upgrading from v2.2 to v2.3 as well? You don't have to as long as you don't have issues. For the 2.3 version, there are two downloads labelled as Darkside and none for Lightside. I'm assuming it's just a filename mixup, but which one is which? I just downloaded from the file labelled Lightside on the site but it actually downloaded a file named Darkside. The file renaming was done by the server. It was messed up by the upload cancellation last night. I had to stop it because I had the old moss.esp in the package. So I tried to pin down what was causing this before posting here. Best I can tell though it seems like probably from the Rocklo1, Rocklo2, and Rocklo4 meshes Majestic mountains adds/replaces and possibly missing textures for them where they are used in this area? So far only seen this on these three rocks around the ring lake here. Anyone else seeing this problem in game? Still no other author on sight? Do I really have to make the update? I'll check if I can reproduce this issue in my game. 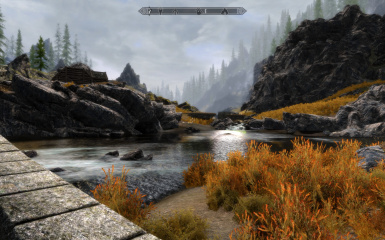 EDIT: Everything looks fine in my game. It's something on your side @Odhan. 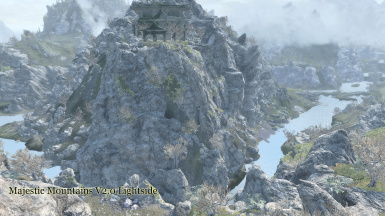 I think it is the best that the rock meshes turn back to 1.84 while the mountain meshes can stay in the current state. I assume that the sulfur 1pass material is causing some issues. I'm not sure what the sulfur pass material is supposed to be. I tried to look through xedit first using the formid's I got via consele. 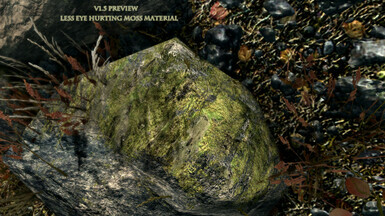 But it don;t give me much other than letting me see which mesh and textures are used there by default, nothing seems to touch those rocks 'records wise', other than dyndolod of course. So I tried looking at my textures and meshes. 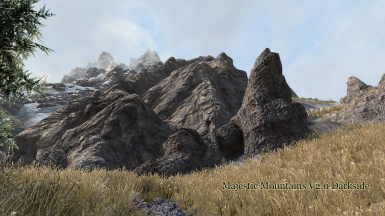 Majestic mountains is only one I could find that replaces meshes for those rocks, unless I missed something somewhere. 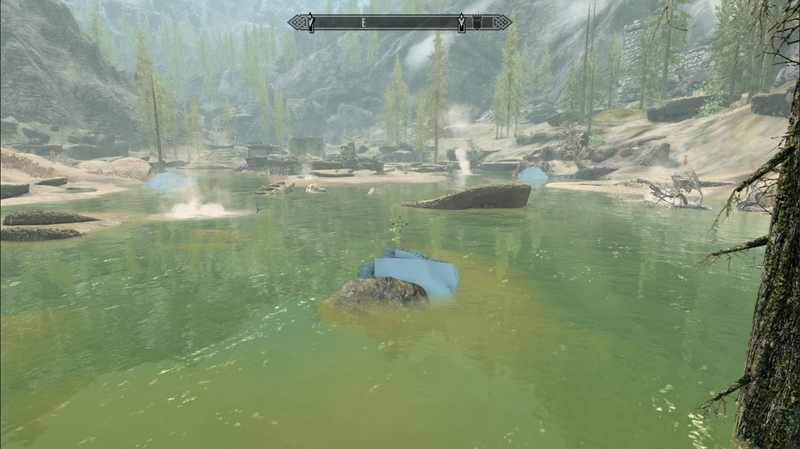 Although I tried checking every mod I have that I could think of that might touch it. 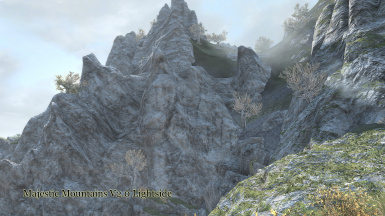 I tried disabling Skyland landscape textures which I load before Majestic mountains, didn't change anything. I do use dynamic snow and dynamic ash.. Although I might of forgot to check by disabling those last night. I'll try checking today. I should still have Improved Snow disabled and bEnableProjecteUVDiffuseNormals set to 1 as recomended for using those.. Though I'll double check in case something changed those without me knowing. I'll update this response once I've double checked these, unless you all prefer me to post new one here? Also I maybe should mention, although I don't know if would make a difference. 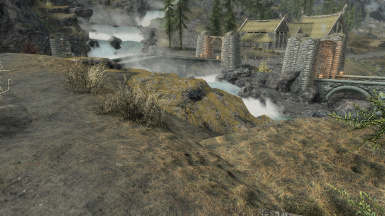 I don't use the projected moss option or sun direction change, although I also don;t use ENB if makes any difference. 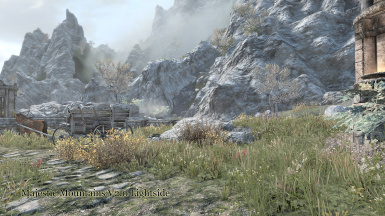 And since Skyland landscapes is supposed to be compatible with blended roads I don;t use complementary textures either. Although I did test to see if the complementary textures would fix it and it didn't. okay I am sorry, but nothing I do or test seems to be resolving it. I've disabled every other mod I can think of that might effect it an no change, I tried the 1.84 version too. 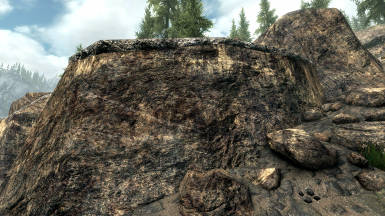 I've checked in xedit, and tried to find the textures that are supposedly supposed to go on those rocks at least by default and can;t find it. 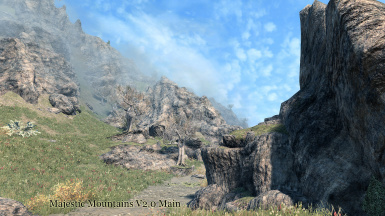 The only thing that has 'fixed' it is either removing(hiding) those meshes from the Majestic Mountains folder (I use MO2) or removing Majestic Mountains. I tried re-validating my game files too just in case. Will removing those mesh files cause problems though?